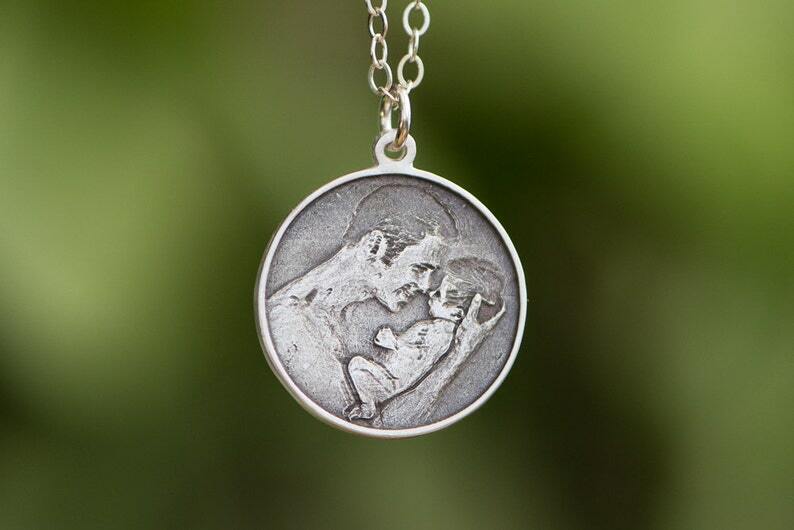 This is a fine silver .999 delicate circular photo engraving pendant / charm of your kid, pet or loved one. We can engrave name and DOB on the back or an additional charge. Great memory, lasts forever, perfect gift!!!! Don't worry I review every photograph before carving to insure the utmost quality in final piece. Engraved Photo Charm - Sterling Silver fits Pandora Bracelets. MAKE SURE you space out your type enough on this tiny stamp. That said the stamp itself is AWESOME and such a neat way to put my signature on my pottery. People in the studio where I do my work are asking about it. I've recommended them here ... thank you for helping me make this stamp work! Custom stamp came out perfect! This item shipped quickly and it works wonderfully with polymer clay. Thank you. We do not refund any custom orders. We go through great effort to make you a great product. If we don't think a particular image will work we would rather return your money before we start. We do offer free refinishing of an item should something happen to it over time. This includes scratches and tarnishing. This is for lifetime of product. Our shipping is a flat $13.00 anywhere in the world and $4.50 within USA. We ship items with insurance and tracking/delivery confirmation. Sorry I wish it was cheaper, it is the same price for multiple items though. Please send us an email if you have something special in mind. We can make all shapes and sizes and would be happy to quote you.